This is a highly original five reel, five row slot, boasting a high RTP of 96.47% and forty paylines. It takes its inspiration from the world of steampunk for its visual and musical style, and has mystery symbol, free spin and win booster bonus features. We’re proud to offer it to players right here at UK Slot Games, where you can also play over 600 slot games, including ‘Starburst’, ‘Rainbow Riches’, ‘Fluffy Favourites’ and ‘Bonanza’. It’s not often that we come across an online slot that almost belongs to a genre all of its own, but Fortunium may have done exactly that. Whilst this is a Microgaming release, it’s actually a collaboration with a brand new slot developer called Stormcraft Studios, who operate as a sub-brand of Microgaming. This is their first ever slot game release. If they’re going to use such original thinking in all of their future games, we’re excited to see what they can do. But is it as good as it is original? Read on and find out. The game is set in a mysterious and eerie looking city, with a visual style that takes several of its cues from the world of steampunk; a popular genre of science fiction that blends steam-powered technology from the past with cutting edge projections of the future. This is a place of mechanical marvel, where alchemy sits side by side with science, and a huge departure from the style that we’ve come to associate with traditional slots. It could be said that the playing area has been sacrificed slightly to show off the backdrop; a cityscape that could come straight from the classic Fritz Lang film ‘Metropolis’, towering high into a foggy and smoky sky. With five whole rows and reels to fit in, the overall effect is that it’s a little cramped and claustrophobic, but that could have been a deliberate choice to fit in with the game’s atmosphere; helped along by a tinkling piano backing track which is both epic and slightly foreboding. Nothing about the symbols in the game are traditional either; although the lower values are represented by imagery from a pack of cards, it’s the symbols of the suits themselves that are present here, rather than the usual J to A selection. They’re illustrated in different colours to ensure they stand out. Along with them we have pictures from this strange new world; a hot air balloon, a gloriously steampunk treasure chest, and some manner of elaborate science fiction gun. There are also two characters; Victoria and Maximilian; both of whom are stacked. You won’t miss the wild; it’s a big gold ‘W’ just to make sure you get the point, and it substitutes for any symbol other than the scatter, which is a green porthole that looks suspiciously like an eye. This can be quite an unsettling game to look at and play, but it’s definitely very cool. Mystery symbols may sometimes appear when you spin the reels. They’re represented by question marks, and they always come in stacks. When they do arrive, they will transform at random into any other symbol (apart from the scatter), which should hopefully bring you a win. The stacks fill the entire reel when they appear, with a pleasing animation as the crates burst open. 1. Free Spins: Free spins are the minimum we should expect from a game that’s been released in 2018, and we’re pleased to report they’ve made it into the game. You can trigger them by landing three (or more) of those eerie looking scatter symbols anywhere on the reels. Given that there’s so much space on the reels, there should be more chance of that happening than you might see in other slot games. Regardless of how many scatter symbols you landed, the reward is always ten free spins; however the number of scatter symbols is still relevant. If you landed three scatters, the second reel will be completely occupied with mystery symbols. Land four, and reels two and three will both be full of mysteries. Five scatters will fill the second, third and fourth reel totally full of mystery symbols, and at that point you would expect wins to be coming thick, fast and large. If any scatters appear during your free spins, each one will afford you one additional spin. 2. Win Booster: This isn’t like the standard ‘gamble’ feature you see in a lot of slot games, but then nothing about Fortunium is standard; this is a more complicated betting affair. 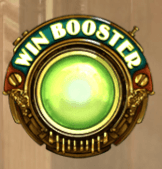 At any point, you can press the ‘win booster’ button (always on display right next to the reels), and for 50% of your stake the game will guarantee that its mystery symbols will only turn into either high value symbols or wilds. It adds an extra dimension of strategy to the game. Whilst it’s probably fair to say that Stormcraft Studios had more to do with the release of this game than Microgaming, very little is actually known about Stormcraft. This was their first game, and we won’t be able to say much about their usual quality or their style until we’ve seen more of their products reach the public. We love their innovation, but they’re still something of a mystery at the present time. Regardless of that, they are still a sub-division of Microgaming, and we know all about them, so let’s look into their background a little further! Microgaming describe themselves as an award winning (more on that in a moment) gaming software developer who supply customers all over the world. They’ve been in the business for a long time, and they claim it was them who developed the world’s first ‘true’ software for online casinos all the way back in 1994, when the internet had barely been born. As if that wasn’t enough, they also claim that they developed the world’s first functional software for mobile casinos ten years later in 2004; again, that was right at the dawn of mobile gaming. That would make them a cutting edge market leader in the gaming world. They’re understandably proud of their partnership with Stormcraft, and the production of Fortunium, but they have plenty of other feathers to their cap, too. The Microgaming roster of online slots include Avalon, Dragonz and Thunderstruck. They also frequently win licensed from big film and TV companies to make their games, which is a sure sign of trust and reliability. The official Jurassic World and Game of Thrones slot games were made by Microgaming. The company has a long track record of releasing new games every single month. The impressive achievements just keep coming the more you look into Microgaming. They’re listed as holding a Guinness World Record; their progressive jackpot is the world’s largest, and has so far paid out more than £800m; that also includes the largest jackpot payout ever seen in an online slot game, when a player in the UK won over £16,000 from a 25p spin! As for the awards? Well, at the EGR B2B awards they’ve won ‘Best Poker Software’ for six of the past seven years. They were the iGaming ‘Software Supplier Of The Year’ for 2018. They won ‘Best Digital Product’ at the Global Gaming Awards in 2014, 2015 and 2016. In short, Microgaming are a big deal, with an incredible reputation for quality. When they release a game, people pay attention. ”Microgaming proudly presents Fortunium, a five by five reel, steampunk themed slot, and the first official release under the new Stormcraft Studios brand. Loaded with thrilling features brought to life by stunning artwork, the thriving metropolis of Fortunium is the ultimate destination for innovators and entrepreneurs seeking acclaim and fortune. Welcoming players to the city are its famous founders, Victoria, expert navigator and acclaimed explorer, and Maximilian, industrious inventor of mechanical marvels. Both characters can appear as super stacked symbols in the game, vividly portrayed in portrait mode with incredible graphics that have been finely tuned to give players a premium mobile experience. Opulence and opportunity await in the base game, where super stacked Mystery Symbols can reveal a random wild, low or high symbol, granting players the chance to win big across multiple lines. Daring explorers can upgrade Mystery Symbols with the Win Booster™ device. When activated, the feature will increase the player’s wager by 50% and turn the Mystery Symbols into only high and wild symbols. Boosted Mystery Symbols will carry over into free spins, where they will remain boosted throughout the round. Fortunium’s soaring skyline provides the backdrop in free spins, which can contain up to three Mystery Reels™. These special reels are loaded with never-ending stacks of Mystery Symbols that can appear on every spin. Landing scatters during the feature will extend the free spins experience, giving players the opportunity to supercharge their rewards. Well, this is awkward! We’ve spent most of the review so far talking about how unique and original Fortunium is, and we stand by that. There are very few games we’ve seen anywhere on the market that are anything like this. It’s a unique creation all of its very own, and comparing it to another online slot is extremely difficult; especially when looking at Microgaming’s own roster. In fairness to Microgaming, part of that is because they have an eye for the unusual. Many of their games play with style and genres that other developers don’t touch, and they approach the creation of their games as if they were making a new video game or a movie. Furthermore, Stormcraft Studios don’t have any other work to compare the game to. Their very next game might be a sequel to this, but until it happens, there’s nothing to go off! That being said, Microgaming have ventured into the world of Steampunk once before. Steampunk Heroes: It says something about the scarcity of the genre that Fortunium finds itself in that we had to go all the way back to 2012 to find Microgaming’s last entry into it. Steampunk Heroes isn’t available in a wide range of places now, but when it was released, players enjoyed it as a quirky five reel, three row slot with 25 paylines. 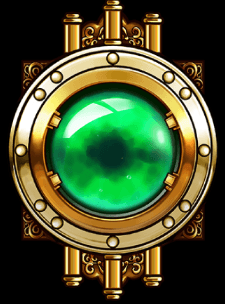 The theming and imagery of the game were unusual, but the game itself was a basic affair; the graphical style of steampunk was present, but not on anything like the scale of Fortunium. People who played it at the time spoke warmly of its atmosphere and its soundtrack, but they didn’t have Fortunium as a base of comparison when they were reviewing it. We’re not saying that Steampunk Heroes isn’t an enjoyable game, it’s just that the six years between the release of that game and the release of Fortunium have changed the goalposts in terms of what’s expected of a top slot game. 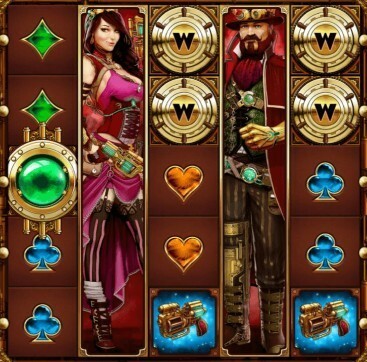 It’s not just Microgaming who don’t really have similar games to Fortunium within their rosters; steampunk inspired slots are rare across the entire industry. Either there’s never been a market for them, or Microgaming have found a market that nobody else is serving. Time will tell. There are two other companies who’ve given it a try before, though. Net Ent tried steampunk out for size with their 2015 release, Steam Tower. It’s a character driven slot that takes direct inspiration from the third of the Back to the Future films, with excellently drawn characters and an attractive game. It has five reels, three rows and a very high RTP of 97%. The only bonus feature in sight is a free spins round, but it does pair up with stacked wilds to give ample opportunity to find one of the 15 winning lines. It’s not as vast or expansive as Fortunium, but it is very pretty to look at and easy to pick up and play. 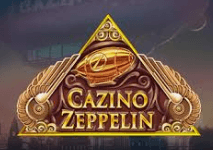 This game isn’t strictly steampunk, but then it is set aboard a casino within a zeppelin, which is a science fiction idea that wouldn’t look out of place in the steampunk universe. The delightfully named Yggdrasil Gaming were responsible for this one back in 2015, and it appears that Microgaming may have taken at least a passing look at it before designing Fortunium; the unusual use of the card symbols instead of card values on the reels looks very familiar. This is a five reel, three row game with 20 paylines and 96% RTP. Activating the free spins features also provides you with chips you can bet at the in-game casino, which is a nice twist. Like the other comparisons we’ve offered, this isn’t as broad or deep as Fortunium; it looks a little like this was an inspiration that Fortunium drew from during its early design stages. This was a concern before we tested it. Fortunium is such an unusual game, which makes such unorthodox use of its screen space, that we were worried it would be completely ruined when we tried to play it as a mobile slot. We couldn’t have been more wrong. There’s a strong argument to say that Fortunium looks better as a mobile slot than it does as a regular one; especially if you play it with your device in portrait mode as opposed to landscape. The cityscape; as impressive a rendering as it is; takes a back seat as the playing area fills the screen, and that slight feeling of cramped content you get from playing the desktop version of the game disappears. Flip the phone or device into landscape mode, and it looks exactly as it does on the desktop. We suspect this game was actually designed for the mobile as opposed to the computer; that would explain the simplicity of the buttons. When viewed on a regular computer screen they look almost suspiciously sparse; on your phone, they’re just right. Many developers worry about how their slot games will translate from desktop to mobile. It looks like Microgaming; or more likely Stormcraft; may suffer from the opposite problem. Every detail of the game that’s present when you play on a regular computer is right there in the mobile version. Whichever way you play the game, that aura of the cool and unusual is still present. When anything new or exciting happens in the world of slot games, there’s always someone there to cover it and report on it. The partnership of Stormcraft Studios and Microgaming excited the industry when it was first announced; and when Fortunium was previewed at the 2018 ICE show, that excitement only grew further. The Casino Players Report website, which monitors industry news, covered both pieces of news in one fell swoop; noting that Microgaming’s partnership with Stormcraft and the Fortunium game were announced within days of each other. Worth drawing attention to in the report is the statement that Microgaming’s content isn’t available everywhere; the company choose to work with a carefully selected network of operators, and not everyone gets approved for it. Hosting Microgaming online slots is a badge of honour, and one that we’re very proud to have at UK Slot Games. Online Casino Reports, another industry news website, went further than Casino Players Report with the level of detail they provided at the time of the game’s release. Like us, they feel that the game is best played as a mobile slot, and even feel that the distinctive 5 x 5 reel and row design may have been specifically chosen because it’s the best fit for a mobile screen. They’re able to shed a little more light on the story behind the game; too. The characters of Maximilian and Victoria are revealed to be an inventor and a navigator respectively, and the founders of the city of Fortunium; a city that’s designed to be a nirvana for inventors, investors and adventurers. They had high hopes for the game at the time of its release; hopes which appear to have been well founded. Why Is UK Slot Games The Best Place To Play Fortunium? As we come to the end of this review, we appreciate that we’ve spent a lot of time talking about just how unusual and innovative Fortunium is. We don’t want to labour the point, but it really is unlike almost any other online slot we’ve ever encountered. The design style is unique rather than being the latest use of a template, the background music is cinematic, the theme is one that’s almost never used in the online slot world, and even the layout of the game bucks the trend. The bonus features are completely unlike the vast majority of slot games too. Time will pass, and it might be that we come to recognize Fortunium’s style as the first use of Stormcraft Studios’ template. If that happens, this game will feel a little less special; it’s standing out from the crowd that gives it so much of its appeal right now. We do not, for a second, believe it will be for everybody. Some people just want to play straightforward, easily understood slots, and there’s nothing wrong with that. For those who are curious though, or those who just want to try something different and find out whether they like it, we strongly recommend giving Fortunium a spin. If you’re considering giving it a spin, we would love nothing more than for you to play the game right here at ukslotgames.com. Secondly, we don’t force you to deposit money when you first sign up. Everybody is welcome to make an account, and you can then browse our entire catalog to find a game you really want to play before you hand over any money. Fortunium is a fine place to start, but there’s no reason to stop there! In fact, we do the opposite of forcing you to hand over money. When you sign up, you could win up to 500 free spins on our games just for doing so!